4x100 Relay Baton Passing - Upsweep, Downsweep or Push Pass? 4×100 Relay Baton Passing – Upsweep, Downsweep or Push Pass? 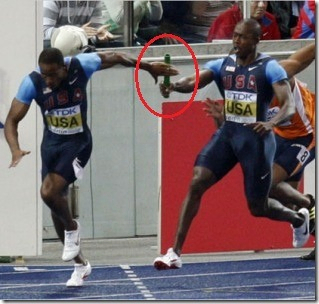 Is there a preference on how to pass the baton blindly in a 4x100m relay? At the International level, Canada, USA & Jamaica all use the push pass. France, however, uses the upsweep pass. 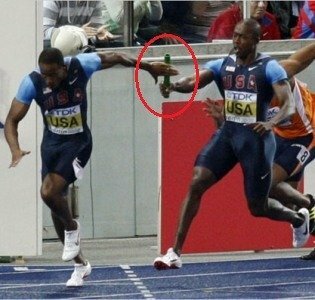 Once upon a time, France held the WR in the 4x100m Relay before the Americans dominated the event. That is, until Jamaica came along. The USA 1968 relay squad of Vincent Matthews, Ron Freeman, Larry James, and Lee Evans used a blind upsweep pass for the 4×400 meters! You don’t see that anymore. Watch the first 3 minutes of this video on YouTube. The two main criteria on deciding which technique to use is (1) successful legal exchange (Duh!) and (2) maximizing the free distance. 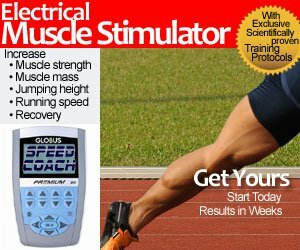 Here’s a good tutorial on the 4x100m relay push pass and calculating 4x100m potential based on your four 100 meter sprinters’ season best. I talked about visual exchanges for the 4×200 and 4x400m in prior articles, as well as calculating splits for the 4×400 (and indoor 4x200m). Upsweep, Down-sweep or Push Pass? Downsweep – Receiving arm extended, but hand level is just above hip height. Hand is almost like a V, and baton is ready for landing between the thumb and first finger. Push Pass – the arm is extended out parallel to the ground and the hand is open with the thumb pointing down. Here are a few key pointers on baton and lane position. Anchor takes the baton on the left hand and stays on the outside when receiving. We’ve seen Carl Lewis switch hands after receiving the baton. While this is totally unnecessary, in all fairness he has never dropped a baton. If you want a good video of the French team relay camp training with the upsweep pass, here’s a great 10 minute video from YouTube. Nice breakout of the various methods. The most recent issue of Track Coach is a good read as well. I’m of the opinion that if the US 4×4 were set up similar to that of the “Lake Tahoe Bunch” you could see changeovers like that. Or may I dare say something similar to the Witherspoon-Taylor connection! Congrats to France for their recent victory. It’s cool seeing how they got it with that video. Just one thing missing, the Upsweep is the best but, the palm is still facing upwards, this is wrong and still causes problems. The palm must be facing down with the thumb pointing outwards, this creates a natural ‘V’ for the baton to enter and makes for a fail-safe baton exchange, it takes pressure off the shoulder (trying to get the palm horizontal) the hand can be kept low and the baton placed with a natural upwards movement by the incoming runner, I could expand but the proof is in the trying. I think we are getting the wrong view of the whole passing the baton issue. It’s not what passing technique is best, but having the best “passing talent” which moves the stick. I have numerous clips of the upsweep failing due to a poor getaway, cutting across the lane on the getaway, and the incoming runner bumping the outgoing runner (all problems that plague the relay regardless of the handoff). Time the baton through the zone and if boys can push 2.2 to 2.0 and the girls 2.2 to 2.5, then you have a good pass through the 20 meter zone. Also, the French numbers were a little off because a number of their men were never on the circuit honing their 100 meter skills so they had “soft”100m PR’s in comparison to the Americans who ran all over Europe. So a guy that never tries to improve his 10.20 block PR, but could run 10.00 looks like a relay demon. The handover needs to be practiced at full throttle, that way the receiver can take off when the incomming runner hits his mark, full throttle means being involved in a race, so these marks are made when runners are pitted against others, even pacemakers will do. When the marks are accurate they are then paced out on the track by placing one foot in front of and against the other and up against the line, that way the mark is accurate every time. The first runner has the baton in his right hand, he runs on the inside of the bend, the receiver accepts it in his left and stays to the right of the track, he keeps it in his left hand and runs on the right of the track, the third runner accepts it in his right and runs on the inside of the bend, the final runner takes it in his left and runs on the right of the track, no swapping the baton to the other hand, this way there is no bumping and if the timing is right, 7-9 paces and hand out, palm down and thumb facing outwards, the baton will go into the hand with one clean movement and with the hand forming a V the baton will slide into the hand no matter where it hits, no sliding off as when the palm is facing upwards and the incomming runner is trying to place it onto a flat palm, there is no looking behind and searching for the baton. 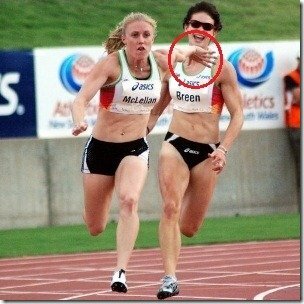 With the palm down, thumb facing outwards, the incomming runner will be able to place the baton with one clean normal running action when the arm is on an upward sweep. If they are cutting across then they are not practised enough and lack track discipline and if they are bumping then they have not practised the take off enough and at full speed. To see the difference just put your arm behind you as though you were about to accept the baton palm up, now with a clockwise motion turm you hand until the palm is facing down and the thumb outwards, feel the difference in the shoulder and get someone to push something up into the V you thumb and forefinger has formed, see how it locks in and cannot miss, it is a no brainer and I am afraid baton passing tecnique does matter. This tecnique is foolproof if practised enough can deduct seconds off a teams time. @Andy – agreed 100% – you must practice the exchanges at full throttle! I’ve watched Glenroy and his guys train in Ottawa, and every athlete in the relay pool must be able to pass and receive, and it’s not uncommon to see them do 1 or 2 passes before the running portion of the workout. Of course, it helps to have the same guys on the same team. @Tony Veney, good point, there will always be “relay specialists”. Plus, the 2nd and 3rd legs are the longest legs, and there is no race for 130m or 140m. Those 2 legs are critical because those athletes have to deal with 2 exchanges. The anchor gets the glory, but every team member is important. All these points are valid and important, handing over to the same guy every time is a must and if that isn’t possible then substitutes must be placed in the same running order as the missing runner, that way the handover can be practised with the same receiver. It seems to me they have no mark laid out for when to take off, that is a must and if it is hard to see the mark then the incomming runner must give some sort of vocal signal when he hits the mark. The most important thing though is the angle of the receivers hand, in the video above they have their palms face down but the thumb is inwards closer to the body, this is wrong, it forces the incomming runner to run almost behind the receiver and can cause bumping, it also forces the receiver to make adjustments to the baton after receiving it. I cannot stress enough, the best way is to have the palm down and the thumb facing outwards away from the body, when the baton is grasped and the arm brought forward the baton is in the correct position in the hand ready for the next handover, no adjustment is needed, it also allows the incomming runner to stay away and run on his side of the track, it also gives the incomming runner a secure and failsafe ‘V’ location in which to place the baton. This one simple change to the technique can make a whole world of difference to the baton exchange.